White House press secretary Sean Spicer sounded off on reports that he is helping in the search for his own replacement on Tuesday, simply stating he's "right here." 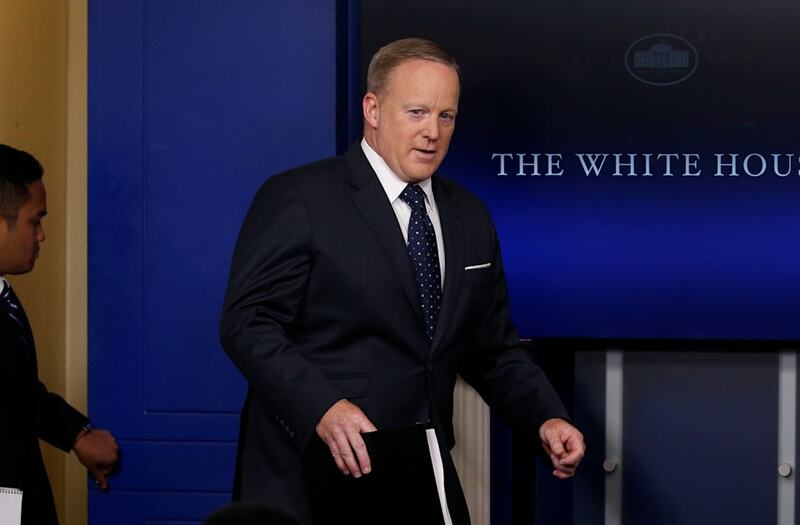 Reports emerged on Monday that Spicer was reaching out to prospective candidates to take over his position as part of a larger White House communications shake up, prompting many to question the press secretary's trajectory within the Trump administration. "It's no secret that we've had a couple vacancies, including our communications director who has been gone for awhile," Spicer said when asked about his role within the Trump administration. "We've been seeking input from individuals as far as ideas that they have. We're always looking for ways to do a better job of articulating the president's message and agenda." Spicer held an off-camera briefing with the White House press corps on Monday, spurring a wave of outrage from reporters. CNN's Jim Acosta even went as far as to call the press secretary "kind of useless." White House chief strategist Steve Bannon weighed in on Spicer's more frequent off-camera briefings, saying they're more prevalent because he "got fatter." Spicer was also asked about the administration's decision to hold less on-camera briefings, to which the press secretary was adamant that President Trump and the current White House communications team are more accessible than those within other administrations in recent history. "We're gonna do what we can to communicate our message," Spicer said. "I think the briefing is one aspect of what we do." Spicer also noted that the White House communications team has made itself available "almost 24 hours a day." "We've looked at a lot of data that suggests that when you look at the number of availabilities and interviews the president has given, it's pretty significant compared to previous presidents," Spicer added. "You always want more."